“CauliRICE”… Confession – I did not want to make this dish. I love rice. White rice, brown rice, jasmine rice, I love it all. Why in the world would you want to change something that is perfect? Well, on days when you want to eat a few less carbs or rather, add in a few more vegetables this is the meal for you! Surprisingly, VERY surprisingly, this “cauliRICE” taste delicious. We were not afraid to add coconut milk, curry spices and a generous squeeze of lime juice but in the end, we had a delicious, healthy meal. I feel it my duty to forewarn you. As you begin to grind up the cauliflower, it stinks…something fierce. Like the kind where Rob and I looked at each other at the same time and said with our eyes “It wasn’t me!” Yep, that bad. I used room spray after I made it. But worth it! The smell lessons as you begin to cook it so hold your nose and give it a try! You do not need a fancy kitchen tool to make this happen. The blender works just fine. I used our vita mix on the lowest speed, doing small batches so as not to make cauliMASH and it worked. That was after grating half the head of cauliflower by hand with a cheese grader. Sigh. You learn. Mix 1/3 cup coconut milk with 1 tablespoon curry powder. Whisk together, add strips of uncooked chicken breast. Let marinate for 30 minutes or longer. 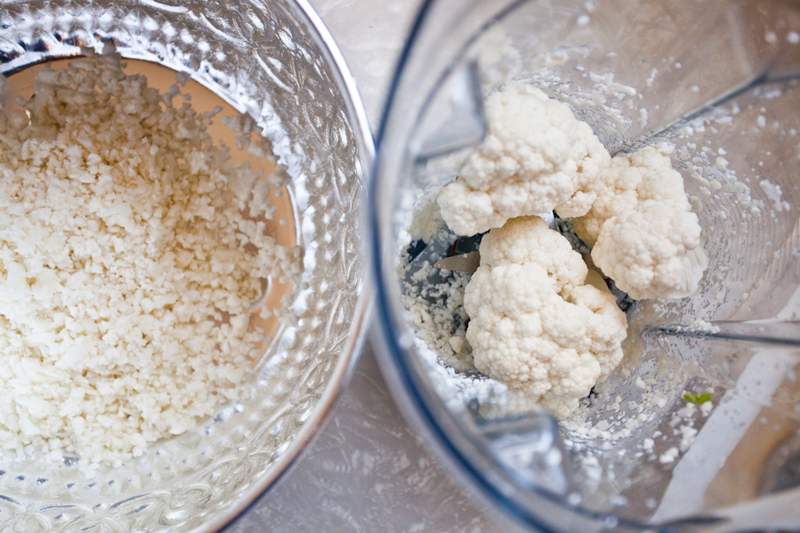 Grind the cauliflower in the blender or food processor until it resembles rice. Melt the coconut oil in a large skillet. Add onions, 5 minutes. Add the cauliRICE and saute for another 5 minutes. Pour in coconut milk, lime juice, honey and salt & pepper, stir. Let cook for about 15 minutes. You can taste the “rice” and see if it needs a little more of something otherwise, cook until softened. While the rice is cooking, saute the marinated chicken in a small pan over medium heat. 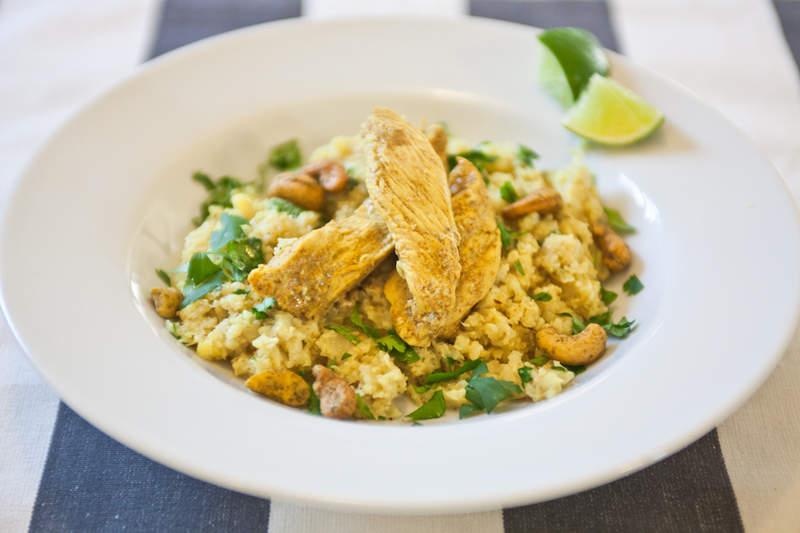 Plate the “rice” add chopped cilantro and cashews, top with chicken. Add a wedge of lime. This dish takes very little time to make if you pre shred the cauliflower and marinate the chicken before hand. Also, we used the thai cashews from trader joe’s and they were delicious! They add a great kick and nice crunch! *This recipe was inspired by Danielle Walker’s “Coconut-lime Rice” from her cookbook Against All Grain. Check it out! I don’t mean to be creepy but in totes salivating! This is going on my menu too! I just found out I like curry, soooooo We will definitely be trying this! I have to tell you I love reading your words. I can hear your voice in them and Rob takes fantastic photos. Your blog is beautiful!